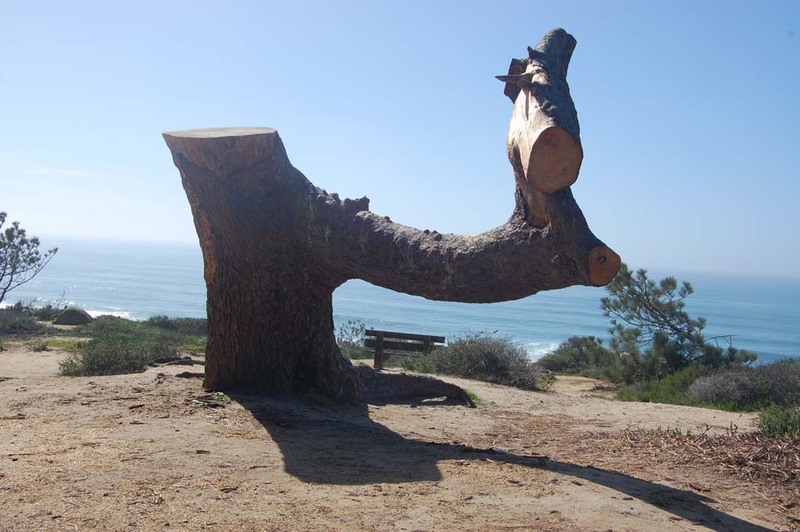 DEL MAR — When Del Mar resident David Arnold was on his way home one day last month he saw a city crew removing a beetle-damaged Torrey pine on the south end of Torrey Pines State Reserve on a patch of land with an ocean view. He asked the trimmers to stop work for an hour to give him time to make a few phone calls. He contacted city staff and received some support to turn what was left of the dead tree into a piece of public art. On Jan. 14, Arnold, an artist who helped design the city logo about five years ago, presented two clay models of a bench to the Parks and Recreation Department, which selected one that was presented for approval at the Feb. 2 meeting. There was some concern that the sculpture would encourage climbing and be a liability, so staff did not recommend going forward with the project as presented. So he agreed to work with the city to tweak the design to reduce the desire to climb on the final piece. Warning signs will be installed and mulch will be added to the base and sides. “I think we think it’s a good idea,” City Manager Scott Huth said. “We’re trying to figure out how not to fully bureaucratize it and … protect the public because there are people that are going to want to climb on this. We’re trying to avoid that. “If people do that at their own risk then that’s like climbing on any of our other trees that we have,” he added. Councilman Terry Sinnott said there is also a financial benefit to transforming the stump into a seat post. “I think this is a great opportunity to use something that has been around for quite a while,” he said. “People climb on this thing all the time. … It’s not like we’re creating a new climbing attraction. “If we don’t do something with it we’d be grinding it up at a cost of quite a bit so this is kind of a little money-saving experiment,” he added. Arnold has enlisted the help of a professional carver to assist him. The design on the side will feature a red-tailed hawk, which he said is the official bird of the Torrey Pines State Reserve. Arnold said it will take about three weeks to complete the carving.